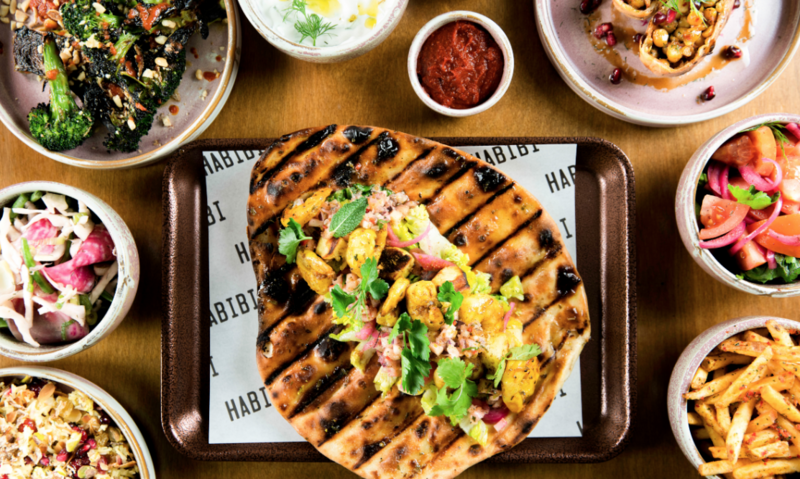 If you’ve paid a visit to New Brighton recently you won’t fail to have noticed that a not-so quiet revolution is stirring, starting with Habibi, which opens today. From last October, giant pieces of street art have begun to appear in the area, commissioned by local company Rockpoint Leisure, marking the start of their plans to help regenerate the road and the wider area. Joining the store are two exciting hospitality concepts, which have opened this month. The first of these, Habibi, is a confluence of cultures, where eastern eats meet western beats. From Brooklyn to Beirut, this constant play of influences shape the venue’s ambitious offer, where urban graffiti mixes with traditional Arabic calligraphy, handmade tiles with rough-hewn concrete – all set against a soundtrack of global Hip Hop artists. Traditional cocktails are delicately scented with Rose, Tangerine and Pomegranate – which sit alongside intriguing limited-edition canned beers, premium draught lines, as well as specially selected wines and fizz. Set on the road’s ‘town square’ and in contrast to Habibi stands The James Atherton pub. Simple, traditional, warm and welcoming, Rockpoint has worked alongside Punch Taverns group, to create the ‘J.A.’ which is redolent of an age where there was a pub on every corner, and which offers great ales and craft beers as well as guest lines.